The pressure compounding is a type of turbine in which the pressure energy of steam is extracted in multiple stages instead of single stages. Figure shows that pressure compounding arrangement of a turbine. It has rows of moving blades and fixed nozzle arranged adjacently. Since it operates at high pressure the whole turbine should be airtight. Here the steam is first directed to moving blades through the main nozzle. While pass through the main nozzle, steam partially get expanded, the pressure drops, and velocity increase. 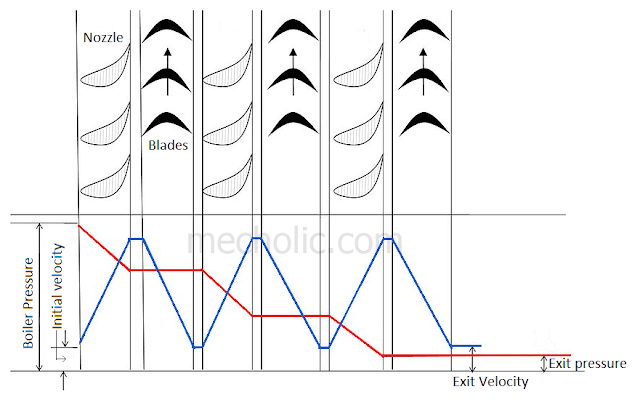 Approximately all of the gained kinetic energy is then absorbed by the first set moving blades. The pressure remains constant while steam passes through the blades. The steam then moves through the second set of nozzle, where it again partially get expanded. The result will be decreasing pressure and increase velocity. Then the steam move to the second set blades, there it continue the similar process happened in first set of blades. Here set of one nozzle and blade consider as one stage. The process will repeat in each step and finally steam leaves the turbine at low velocity and pressure. In curves of velocity and pressure shows that the absorption of pressure energy in multiple steps. This type of compounding of turbine known as pressure compounding. The inlet steam velocity for each set of the blade is essentially equal, and velocity is very less when compared to velocity compounding. The velocity of steam is lower than that of velocity compound turbine. 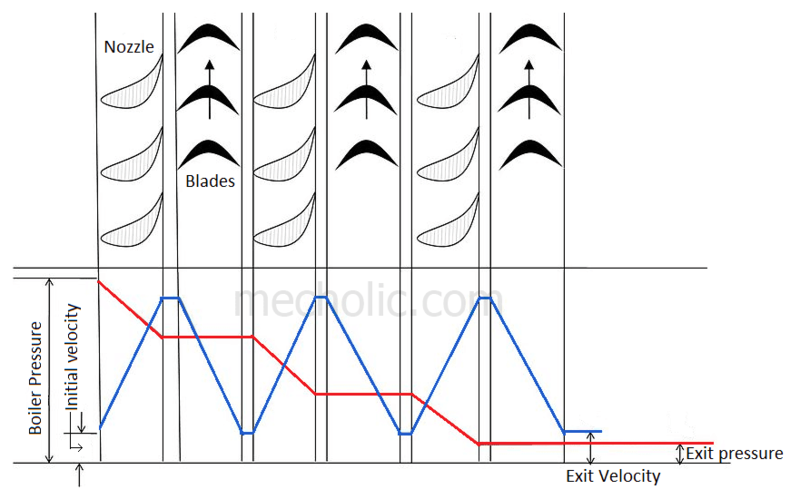 Most efficient turbine because the ratio of blade velocity to steam velocity is constant. Since pressure compounding includes the partial pressure drops in nozzle, the whole turbine should be airtight. Large number of stages are required.